Looking for a ride? Haven’t made plans yet? Everyone knows to check out the Ride Calendar, but did you know that we have a listing of “Alternate Rides”? The Ride Calendar is reserved for Club-led rides and Club events such as the Icicle, Doublecross, Annual Picnic, Monthly Meetings, etc. We do not list events that are being put on by other organizations on the Ride Calendar. We do however receive plenty of requests from other organization to promote their events to the membership in an effort to gain support and for those we do have a place to promote their events – Out of Bounds. Out of Bounds is a section within the website that is reserved for just that, providing the membership and anyone that visits the website with information about cycling-related events, whether they are bike races, charity/fundraising rides, multi-day trips or even international bike excursions. Anything that is forwarded to us that has a cycling theme or purpose is posted there. Not feeling like a ride but want to do something cycling-related, maybe looking to give some of your time to a worthy cause, consider volunteering for events that are posted in Out of Bounds. Many of the events are just like our four major events, their success is predicated on the hard work of friendly volunteers. For ease of use the Out of Bound web page is organized in chronological order with the events being grouped by month. Information like Location, Date, Start Times, Routes, Cost, Registration, Purpose, Maps, and web site links can be found for each event if provided. If the requester provided the information, our webmaster team has formatted and posted it. Check back often as we are always receiving requests for postings. Just this week we added another five to the web page. At present that are twenty-two events listed. Also, if one of the events piques your interest but it is weeks or even months away, check the posting and visit their web site as they may be offering reduced fees for early registration. Although we want you to stay engaged and support the activities of the Club, we know that there are times when you just can’t do that, so we want to make sure that you know that there are alternatives. A disclaimer – the Club is only supporting these events so far as to post them on the website. Quite often we do not know anything more about the events than what you see posted, so we leave it to you to do a little research about the event if you plan to be involved. Quite a few are reoccurring events that have been around for years, but some are new to the Out of Bounds page. 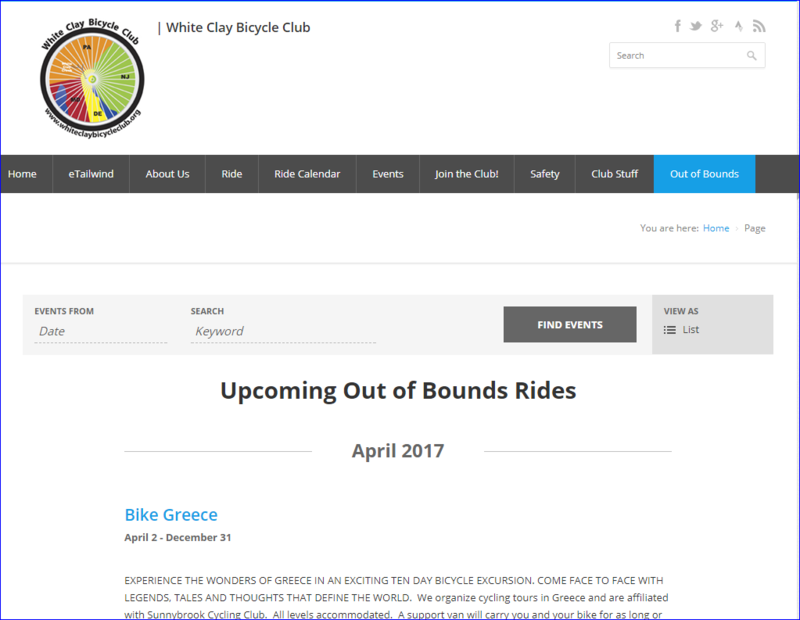 Feel free to share your experience, good or bad by forwarding information to me at president@whiteclaybicycleclub.org and I will share with the membership.